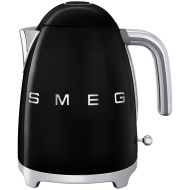 alaTest has collected and analyzed 18 reviews of Smeg KLF 01 PBEU Bleu Azur. The average rating for this product is 3.1/5, compared to an average rating of 4.4/5 for other products in the same category for all reviews. People are impressed by the performance and price. The usability and noise also get good views, whereas the durability and reliability get less positive reviews. We analyzed user and expert ratings, product age and more factors. Compared to other products in the same category the Smeg KLF 01 PBEU Bleu Azur is awarded an overall alaScore™ of 83/100 = Very good quality. Great looks great and does the job.i wanted a kettle that looked good with the rest of the kitchen and it does the job of boiling water. Buy a cheap one instead. Smart and posh kettle, love the colour, looks fab in the kitchen! Looks just great next to the smog matching toaster! Quiet, rapid boiling, simple to use, no difficult lid to remove and looks fabulous too! Looks good but had to return. My kettle looks great in the new kitchen, however, be aware that steam seems to escape from the lid and the spout is very hot - so don't make the mistake of touching it.